For most people, headaches are not everyday occurrences, and they are typically relieved with the help of an NSAID pain reliever. Headaches can be a more frequent burden in people who experience chronic headaches or migraines, which will not respond to the typical treatment approach of pain relieving medication. With headaches of this nature, there may be a number of complex factors at play, causing regular pain and discomfort. Your first instinct for headache relief may not be to visit a chiropractor, but Goyke Health Center actually specializes in chronic headache relief, utilizing a treatment approach focused on spinal manipulation and gentle adjustments of the cervical spine in the neck. Keep reading to get a closer look at how we can help you find ongoing relief from debilitating migraines and headaches. Chronic tension headaches and migraines are very similar, in that they can cause severe, sudden pain that gets in the way of everyday activities. They do, however, have some distinctive symptoms and different causes, which may guide treatment with our chiropractor, Dr. Kevin Goyke. Tension Headaches – Tension headaches do not always originate in the head, since they result from the tensing and tightening of muscles in the neck and scalp. This tensing of the muscles may be triggered by physical or emotional stress related to dehydration, inadequate sleep, anxiety, or poor posture. Chronic tension headaches can be easier to live with than migraines, but the pain is often a significant nuisance for patients. Migraines – Migraines are more than just headaches, since they can cause extreme sensitivity to light and sound along with symptoms like nausea and vomiting. 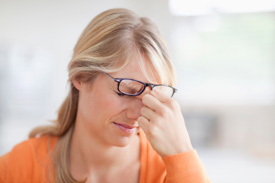 The sensory symptoms that often accompany migraines generally keep migraine sufferers from completing daily activities. The exact cause of migraines is not clear, though there are a number of known migraine triggers, which can be managed with chiropractic adjustments, nutritional planning, and additional therapies in our practice. You may be surprised how much a small, gentle adjustment of the vertebrae in the neck can relieve headaches and migraines. The reason this treatment approach is often so effective is that the cervical spine is highly linked to your neurological health. Tension in the neck caused by poor alignment of the vertebrae might aggravate migraine symptoms or lead to more frequent tension headaches. You do not have to suffer through regular headaches and migraines thanks to the care of Goyke Health Center in Geneva. We offer free consultations for first-time patients, so call us at (630) 715-1183 to schedule your initial diagnostic visit and get on the path to a pain-free future.